I Keep Forgettin’ (Chuck Jackson, (prod. Leiber/Stoller) 1963). I Keep Forgettin’ (The Artwoods, 1966). I Keep Forgettin’ (Topmost, 1967). I Keep Forgettin’ (The Checkmates with Sonny Charles (prod. Phil Spector), 1969). I Keep Forgettin’ (Procol Harum, (prod. Leiber/Stoller), 1975). I Keep Forgettin’ (Michael McDonald, 1982). I Keep Forgettin’ (Bowie, 1984). In 1963, Smokey Robinson warned Chuck Jackson that his new single, “I Keep Forgettin’,” was too ahead of its time to be a hit. Robinson was right: it only reached #55 in the pop charts. But “Keep Forgettin’ ” was a magnificent track, one of the great later compositions of Jerry Leiber and Mike Stoller, and one of their most radical productions. (It’s arguably one of Leiber and Stoller’s challenges to the rise of Burt Bacharach and Hal David). It wasn’t just Leiber’s typically clever lyric (in the first verse, the subjects of the action are typically passive objects, like feet and fists, with the singer reduced to a set of motor functions) or Stoller’s unusual song structure, with its varying tempos and times (bars of 2/4 slamming into cut-time 4/4 bars) and its wrong-way round construction, with the chorus backing into the verses. * The entire production of the track seemed intended to put the listener on edge. Jackson sings the first half of the song almost entirely over percussive instruments (marimba, tambourine, shakers, toms, timpani, and piano and guitar here serve in percussive roles) with only a few touches of harmonic ones: brief horn responses, barely-heard strings, dashes of accordion. (It’s an ancestor to Amerie’s “1 Thing.”) It makes Jackson sound like he’s standing alone, trying to keep his balance. Sure, the backing singers give him temporary assistance, the horns take over a chorus to give him relief. But the overall feel is of a man unmoored, one at the mercy of random elements. Leiber was so delighted by what he, Stoller and Jackson had done that he performed a wild dance after the session, with his knees almost coming up to his chin. (as per Ken Emerson’s Always Magic in the Air). But the Jackson version was so singular, so wild and out of its era, that it didn’t reach a mass audience. Essentially uncoverable, “Forgettin'” became a cult favorite among Sixties R&B fanatics. Not that bands didn’t try to master it: the Artwoods (a rival to the Yardbirds, its lead singer later helped found Deep Purple) put an organ in place of the accordion, giving their version some majesty, while Topmost (from Finland!) seemed a bit flummoxed by the tempo. Phil Spector, who had started out as an apprentice with Leiber and Stoller, bungled his own attempt with a Sonny Charles record that sounds as though it had been waxed onto molasses. (Leiber and Stoller later domesticated their song, producing a Procol Harum cover in the Seventies that turns “Forgettin'” into a weary soul lament—-where Jackson was at war, Gary Brooker has conditionally surrendered). Bowie had always wanted to cover “Forgettin’.” His memory of it possibly triggered by the then-recent Michael McDonald hit that had inadvertently ripped off the song (forcing McDonald to list Leiber/Stoller as co-composers), Bowie decided to cut a version on Tonight, as he had an adept rhythm crew assembled: Guy St. Onge on marimba, Sammy Figueroa on percussion, the typically solid Omar Hakim on drums and Carlos Alomar’s in-the-pocket rhythm guitar. The result, though, was a tacky mess. It’s Bowie taking a modernist, even avant-garde song from 1963 and bloodily reducing it to an “oldie,” hoping to create some general nostalgic vibe, having his singers overact as usual and throwing in a guitar solo that sounds like it’s being played by an automaton at a Disneyland “Old Time Rock and Roll” exhibit. Pushing up the tempo from the start and so gutting any sense of anticipation and development, Bowie seems unable to let the song breathe: it’s a party song seemingly performed at gunpoint. And where the Leiber/Stoller production still sounds sharp and fresh (the stereo mix in particular), Bowie, Hugh Padgham and/or Derek Bramble’s version now sounds terribly dated, with the gated tom fills and the usual malice from the Borneo Horns. Toxic album filler, “Forgettin'”‘s placement on Tonight (the second-to-last song on the B side) made it the last straw for listeners who had somehow endured the record to that point. Recorded May 1984, Le Studio, Morin-Heights, Quebec. *Addendum: Leiber and Stoller’s occasional collaborator Gilbert Garfield is also credited as a writer on “Keep Forgettin’.” Garfield was a singer, a member of the Cheers, and so may have been responsible for the vocal melody and other pieces of the song. 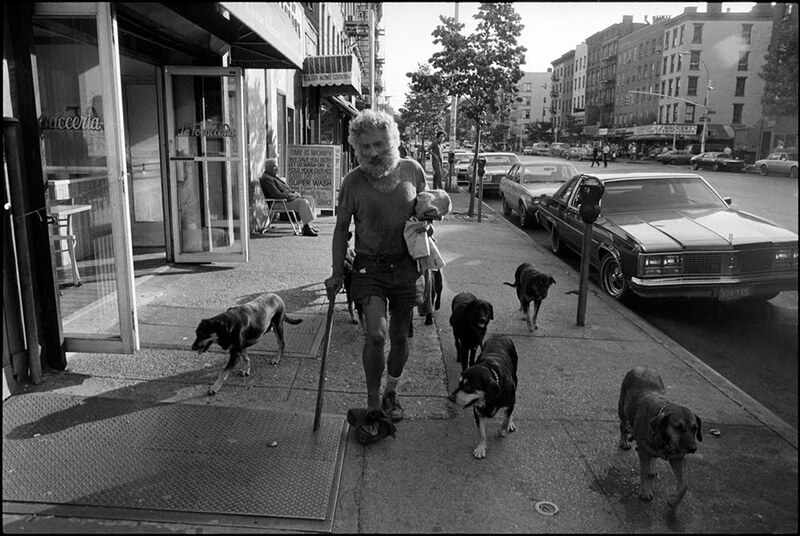 Top: Ted Barron, “Dog Man of the Lower East Side, First Avenue, New York, NY, 1984.” One nice thing about reaching the mid-Eighties in this survey is that I can begin showcasing the work of my friend Ted Barron. Ted has just co-produced a book with Drew Hubner called East of Bowery: it’s very much worth your while.